Pimento cheese has a dirty little secret. It's not really Southern at all. I know, I know. What could be more southern than pimento cheese? It's “the pâté of the South” and “Carolina caviar.” The green paper-wrapped pimento cheese sandwiches served every year at Augusta National during the Masters are legendary. In The Place Setting: Timeless Tastes of the Mountain South, Fred Sauceman writes that pimento cheese “lines up alongside barbecue, grits, and cornbread as one of the foods that define the South.” Larry T. McGehee called it, “one of those major southern distinguishing institutions, right up there as a subject of debate with religion, politics, barbecue, biscuits, gravy, mint juleps, and the proper age for curing of country hams.” And, as everyone writing about pimento cheese seems compelled to note, it's a delicacy almost completely unknown outside the bounds of the Southern states. That may be true today, but it hasn't already been that way. In fact, pimento cheese's Southern identity is really just a few decades old. The origin of pimento cheese consistently stymies food historians. Everyone has assumed that it was a Southern invention. Some speculate it must have originated back around the beginning of the 20th Century, when big rounds of hoop cheese first became widely available in Southern country stores. Most, however, quickly admit a lack of evidence and chalk it up as a story lost to history. The truth of the matter is that everyone has been looking in the wrong place. To find the origins of pimento cheese, you have to turn your sights up north of the Mason-Dixon Line. Curious as it may seem, the “pâté of the South” was created through the combined efforts of Northern food manufacturers and cookbook writers from the “Domestic Science” movement, who together invented a brand new product and then made it popular throughout the country. Almost all pimento cheese recipes today call for blending grated cheddar or a similar firm cheese with diced pimento peppers, mayonnaise, and various seasonings. The original version was quite different. It started as a way to combine two newly-available products of industrial food manufacturing: cream cheese and canned pimentos. Cream cheese was first made after the Civil War in New York State, where farmers in a growing dairy industry needed new ways to market their products. According to one legend, a farmer named Charles Green invited a European cheesemaker to the town of Chester, New York, in the 1870s to teach Green how to make Neufchatel cheese. The European's instructions were overheard by William Lawrence, who for some unexplained reason, was lurking outside under an open window. Lawrence raced off to try the recipe, but got the measurements wrong and ended up using twice as much cream as the French formula. The results of this fortuitous accident was the soft, unripened product we know as cream cheese today. The dramatic details of this story are, in all likelihood, complete bunk, but the actors themselves seem to be correct. Federal District Court records identify William A. Lawrence as the first person to make Neufchatel cheese in the United States, and the only manufacturer until 1875. In 1883, the New York State Inspector of Milk investigated the manufacture of Neufchatel and found two factories in Chester, that of Lawrence and Durland and that of Charles H. Green. Green used milk alone in making his cheese, which he wrapped in paper and tin-foil and packed in boxes marked “Neufchatel.” He turned out some 3,000 five-ounce boxes of cheeses per day, but the factory of Lawrence and Durland sold even more--5,000 cheeses per day. The inspector also discovered that Lawrence and Durland skimmed their milk and ran it through an emulsifier, where it was mixed with one and a half pounds of lard for every hundred pounds of milk. For this, he pronounced the cheese to be adulterated. The finding didn't seem to hurt the company's business, for they renewed the registration of their product’s trademark in 1904 and 1906 and brought an infringement suit against a rival firm in 1913. By 1900, at least five companies were making Neufchatel in New York state, and they introduced several variations, including cream cheese, which soon eclipsed the popularity of the original. Cream cheese was made by mixing cream with Neufchatel curd, and it was typically molded in rectangular forms in the same 1-1/2 by 2-1/2 by 2-3/4 inch size that is still commonly used for the product today. Though produced primarily in New York, the variety somehow became linked with the city of Philadelphia, and “Philadelphia Brand Cream Cheese” became one of the market leaders. In 1903, the Phenix Cheese company of New York City bought the trademark for Philadelphia Brand Cream Cheese, and after the company merged with the Kraft Cheese Company in 1928 it became the country's top-selling brand. Cream cheese is just one half of the story. The other is pimento peppers. Through most of the 19th century, the word pimento meant allspice, the unripe berries of the Eugenia Pimenta evergreen from Jamaica and the West Indies. It was not used as a term for sweet red peppers until the 1880s, when recipes calling for “sweet Spanish peppers” began appearing in print. In the 1887 edition of Miss Parloa's Kitchen Companion, Maria Parloa noted that such a pepper, when green, “is much milder than the common bell-pepper, although they look so much alike it is often difficult to distinguish them.” She recommended that they be stuffed and baked. Thomas Jefferson Murrey, one of the most popular cookbook authors of the era, was a proponent of the sweet pepper, too, incorporating it into recipes for salmon a la Creole, boiled beef salad, and omelet with Spanish pepper. In the late 1890s, imported Spanish sweet peppers started being canned and sold by large food manufacturers, which not only boosted their popularity but also introduced the Spanish name pimiento. Soon the “i” was dropped from common usage, and by the turn of the century most print accounts of the peppers call them “pimentos”. Cream cheese and red pimento peppers hit the market just as a powerful new force was rising in American culinary life: Domestic Science. Also called “home economics”, this woman-led reform movement sought to bring order and scientific precision to all aspects of the home, most particularly the kitchen. Centered at institutions like the Boston Cooking School and led by personalities like Ellen Richards, the first woman admitted to the Massachusetts Institute of Technology, and Fannie Farmer, the “Mother of Level Measurements,” the domestic scientists were both instructors and evangelists, and their recipes and ideas about cooking forever changed the way Americans ate. And that included bringing pimento cheese to the South. Cream cheese and Neufchatel embodied the ideals of “scientific cookery”. They were soft and mildly flavored, and their clean white color connoted purity. That they were something new and sold by modern food manufacturers only added appeal, for the Domestic Scientists were passionate advocates for modern industrial canning and food packaging. Cookbook writers and journalists folded the soft white cheese into all sorts of those innovative new recipes for salads and hors d'oeuvres that today make our stomachs churn. They rolled it into balls to serve in lettuce cups, wrapped it in slices of dried beef, and combined it with nuts or herbs for stuffing into celery sticks and hollowed out radishes. Canned pimentos were ideal for the scientific kitchen, too. Their mild, sweet flavor was inoffensive and unlikely to stir the baser appetites and, since the presentation of food mattered as much or more to the Domestic Scientists as taste, their flashy red color was perfect for brightening up a plate. Canned vegetables were still expensive luxuries at the time, connoting elegance and sophistication, so tins of imported Spanish peppers held a particular cachet. In 1899, the editors of the Boston Cooking-School Magazine included a cauliflower and pimento salad on their Monday dinner menu for August, noting that, “on account of their brilliant color, pimentos are a pleasing addition to many a salad, and when used sparingly their sweet, mild flavor is usually relished.” In 1908, Jane Hegner advocated in Good Housekeeping that housewives adopt pimentos because “these are more juicy and richer than the ordinary sweet green peppers, while their vivid color lends an attractiveness to any dish.” She recommended them in pimento timbales, pimento omelets, and pimento patties. 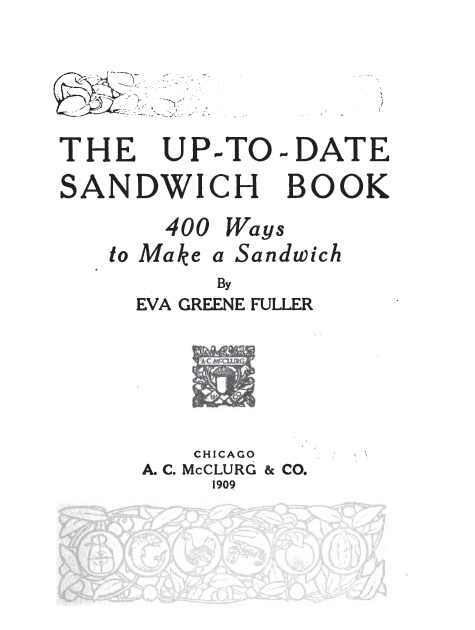 The Up-to-Date Sandwich Book (1909)It seems almost inevitable that these two favorites of domestic scientists would be brought together. Janet McKenzie Hill, the editor of the Boston Cooking School Magazine, published the following salad suggestion in her 1899 cookbook Salads, Sandwiches, and Chafing-dish Dainties: “Lettuce, Neufchatel cheese in slices, and shredded pimentos.” It's not quite pimento cheese, but it's close. A decade later, Jane Hegner's 1908 Good Housekeeping article described sandwiches made with a spread of soft cream cheese with mustard, chives, and minced pimento mixed in. The following year, Eva Green Fuller's Up-to-Date Sandwich Book presented a more basic version of the pimento cheese sandwich: “Grind two small cans of pimentos with two cakes of Neufchatel cheese, and season with a little salt. Spread on thin slices of lightly buttered white bread.” Dozens of similar recipes appeared in magazines and cookbooks in the 1910s and 1920s. It wasn't long before dairy manufacturers discovered that pimento cheese was a great way to extend their product lines. They experimented with plenty of other additions to Neufchatel curd, like olives and chopped nuts, but none took hold as firmly as pimento cheese. To make it, they ran pimentos through a mechanical chopper and mixed them into Neufchatel curd along with a pinch of red pepper just before the cheese was molded. Producers initially sold pimento cheese wrapped in parchment and tinfoil, just as they did plain Neufchatel or cream cheese. But, the product didn't stay fresh very long, and they soon switched to packing the cheese in three- or four-ounce glass jars with screw tops, which both extended the shelf life and let purchasers leave the jars out on their tables as serving containers. The South can't claim pimento cheese as its own invention, but the state of Georgia was actually the center of the nation's pimento growing and canning industry. (This is a topic I delved into in more detail in a prior post.) Some commentators have advanced the theory that because Georgia produced most of the pimentos in the United States, the peppers were more easily availability in the South and, therefore, foods like pimento cheese became more popular in that region than elsewhere in the country. It's a good theory, but the peak period of Georgia pimento production—the 1920s through the 1940s—corresponds directly with the nationwide pimento cheese boom. Georgia pimentos were canned and shipped throughout the country, and their availability seems to have increased the popularity of pimento cheese nationally and not just in the South. Pimento cheese started out as a relatively anonymous commodity, but before long the big dairy manufacturers cranked up their marketing machines for the creamy spread. Kraft and Borden were both major producers and advertised their brands widely from the 1920s through the 1960s. Bluhill, a Denver, Colorado dairy, had the leading Western brand in the 1920s, ‘30s, and ‘40s. It was a hot commercial product, and there was nothing Southern at all about it. I'll try to answer that question in a future post. Robert F. Moss is the Contributing Barbecue Editor for Southern Living magazine and the author of numerous books on Southern food and drink, including Barbecue: The History of an American Institution, Southern Spirits: 400 Years of Drinking in the American South, and Barbecue Lovers: The Carolinas. He lives in Charleston, South Carolina.